Roy Jackson feared he wouldn't be able to build a home on his property near Indian Canyon Golf Course because of a water rights decision. Steve Hagen had no idea why the deal was falling through. 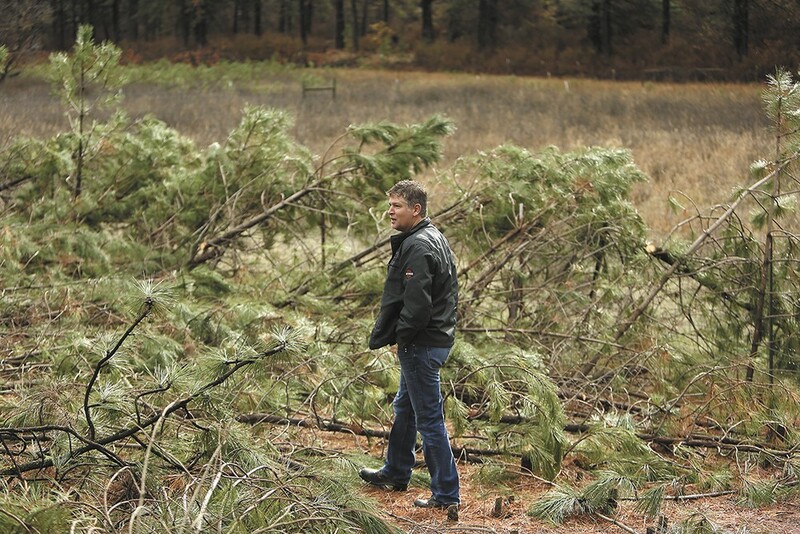 The potential buyers of a 10-acre parcel south of Deer Park made their offer in cash. A builder was ready to build their dream home on the land. All that was left was approval of the building permit. But Spokane County wouldn't issue the permit. The buyers rescinded the offer, citing a state Supreme Court decision. Hagen, a real estate agent with Keller Williams Realty, wanted answers. Hagen took to Facebook and asked other realtors what was going on. He had heard that counties on the other side of the state weren't issuing permits to use water on some new home developments. But not here. Not in Spokane. Right? "I asked, 'Did anyone know about this?'" Hagen says. "And it just blew up." As he quickly found out, the Oct. 6 decision by the Washington Supreme Court — the Hirst decision — would have huge impacts on development throughout the state, including Spokane County. For property owners looking for permission to drill a well, the ruling says it's no longer enough that water is physically available. Now, you'd have to prove that the well wouldn't impair anyone else's ability to use water if they already had the right to it. The court clarified that this applies to so-called "permit-exempt wells," typically private domestic wells that were exempt from the water permitting process. And it shifts more responsibility from the Department of Ecology to counties to determine if a new well will infringe on someone else's water rights. The Hirst decision outraged many realtors, developers and property owners in rural areas. Some people, like Spokesman-Review columnist Sue Lani Madsen, said the decision will block any new development in the state. Some elected officials have said it will come down to a "legislative fix," and called on voters to help oust the three Supreme Court judges up for re-election. Spokane County officials found a way to let people apply for building permits under the old rules until the last possible second, allowing deals like Hagen's to finally go through before it was too late. But are they overreacting? Could this be, instead, a solution that will actually protect property owners from having their own wells dry up because there are too many straws in the proverbial cup? According to Futurewise, an anti-sprawl environmental group that filed the lawsuit leading to the court's decision, it is that simple. "The reaction to this, I think, is a little surprising, considering what it's requiring," says Kitty Klitzke, Eastern Washington program director for Futurewise. "What it's requiring communities to do is plan for water availability when they plan growth. I mean, that's just absolute common sense." "These," says Spokane County Commissioner Al French, "are our heroes." In the Spokane County Commissioners' hearing room on the evening of Oct. 19, a projector screen shows the faces of at least a dozen state legislators in the region, many of whom are in the room as French speaks. He tells the packed room to keep their emotions in check throughout the meeting. "I can tell you that the Board of County Commissioners shares that emotion," he says. "And we are concerned about the impact that [the Hirst decision] is going to have, not only on the county as an entity, but on individuals within the county. All three [commissioners] are committed to the concept of protecting water rights, as well as property rights. And so we're going to get through this together." Mike Hermanson, a water resources project manager for Spokane County, steps up to the podium to explain what the Hirst decision means. When the state's Growth Management Act passed in 1990, it required that builders must have an adequate source of water to serve a proposed building. County governments, Hermanson says, assumed that meant you need to demonstrate only that there's sufficient water supply before issuing a building permit. If the Department of Ecology didn't step in and say that the water would infringe on someone else's water rights, the county assumed the water was legally available. "So the assumption was no news is good news. If we didn't hear there was no water available, then water was available," he says. The Hirst decision turns that assumption on its head. No longer can counties rely on the inaction of the Department of Ecology. Counties, Hermanson says, must determine if a building permit that's going to be served by a private water supply — mostly used by homes in rural areas — is impairing any water rights. It gets trickier when considering water basins with what's called an "instream flow" rule. The Little Spokane River watershed in north Spokane county — encompassing the Mead area, Chattaroy and Deer Park, all the way into Pend Oreille County to the north — has such a rule, meaning the river has a minimum flow that cannot be impaired. Coupled with the Hirst decision, that sets an impairment standard that is "almost impossible to meet," Hermanson says. "So when someone comes to get a building permit, and we look at the information, and we're asked, does this new use — does it have legally available water? We have a hard time answering that it does," Hermanson says. "And if we did answer that it did, we would be de facto saying that you have legally available water, and then we would be on the hook for that decision ... so that's kind of the conundrum we're in." As Hermanson speaks during the meeting, the crowd grows angrier. One woman in the back storms out in fury because of what this means. Officials say the county is working on ways to work around the issue. A water bank, for example, in which the county buys up water rights to sell to homeowners, is one solution, but it's two years out. The only fix, says French, is for the state legislature to change the law so that the Supreme Court can't interpret it the way it did. State Senators Mike Padden and Michael Baumgartner promise that the legislature is working on it. In the meantime, the county told people they had until Oct. 26 to submit building permit applications under the old rules. Eric Johnson, Spokane Association of Realtors chair of government affairs, tells the Inlander that the Hirst decision could "shut down all industry" and "all rural development." Property owners will see their land devalued, he says. Contractors could lose work. He blames Futurewise and the Supreme Court for what he sees as an unreasonable decision approached in the wrong way. "This is Machiavellian, as far as how they've gone about it. It's a slash and burn, just, 'Hey, shut it down,'" Johnson says. A month ago, Roy Jackson bought a property about five minutes from downtown, near Indian Canyon Golf Course. He plans to build a house there on the 10-acre property out in the country. He wasn't going to get his building permit until spring, but then someone told him that if he wanted a guarantee he could drill a well for water, he'd have to submit the application by Oct. 26. He got the application processed in time after waiting at the county's building and planning department office for almost five hours. The office was packed with people, all trying to get their applications in before the new rules took effect. The department processed 453 building permit applications from Oct. 20 until the 26th, a 900 percent increase from a typical week this time of year. "It was literally a madhouse down there," Jackson says. Of those applications, Suzy Dix, a realtor who sells a high number of rural properties, submitted 35. Dix, who calls herself a strong conservationist, says there are other things to consider besides sales. While she waited in the office, she found herself explaining to people how water rights work — how people who have had wells on a property that uses the Little Spokane River watershed have seen their wells dry up because people upstream put in exempt wells. This problem should have been fixed a long time ago, she says. "We're running out of water. People are using too much water, and the government hasn't been regulating it," Dix says. "And now they do, but they do it in a very ferocious way that really affected a lot of people." Susan McGeorge, manager of the Whitworth Water District, says she is not surprised by the decision, and thinks it's logical. But she is concerned at how quick of a change it represents. The water district has had a "large percentage of rural land" where exempt wells have gone dry, but the court didn't consider the ramifications on the economy when making its ruling. "The rug has been pulled out," McGeorge says. "I feel like there is an awful amount of people that are in the middle, and haven't drilled their wells this year, and I don't think they got their permits in time." Tim Trohimovich, director of planning and law for Futurewise, says the Hirst decision is designed to protect those senior water rights holders who run out of water. The decision, he says, will have a positive effect on protecting their water rights. "I certainly think there's an overreaction. The concerns about shutting down development are overblown," Trohimovich says. Futurewise's Klitzke thinks people have yet to see the bigger picture. And maybe, she says, development should halt in some areas to protect the water.